This article was initially published on this blog on February 27, 2012 under the heading Optical Glasses. For those interested, it is being republished. One of the most important substances needed to create photographic images is glass. It is used in the manufacture of photographic lenses, camera viewfinders, SLR mirrors, filters, negative carriers in enlargers, condensers in enlargers and projectors, slide mounts, and more. As a matter of fact, photography, as we know it today, would not be possible without glass. The manufacture of glass was already known to the Egyptians about 3000 BC and was further perfected by the Phoenicians who are credited with the invention of the glass blowpipe. During Roman times, glass making was elevated to an art form. Especially the manufacture of highly decorated small glass vessels (fondi d’oro) became very popular. This culminated in the 13th century in Venice with the manufacture of highly artistic glass items. Yet even in the 16th century, glass, even window glass, was considered to be a luxury item. It was also in the 16th century that the first glass lenses appeared in the camera obscura, which was a major step in the development of photography. According to the dictionary, “glass is a hard, brittle, transparent or translucent, greenish solid solution made by melting a mixture of silica (sand) and various silicates” like soda, borates, phosphates and potash, with metallic oxides added to give the product special properties. Colorless glass is obtained by adding manganese, which neutralizes traces of iron in the sand. Different tints are obtained by adding various metallic oxides. For instance, gold and copper will result in a red color, manganese violet, cobalt blue, iron and chromium green. Depending on the composition, some glass will melt at temperatures as low as 500° C (900° F), others melt only at 1650° C (3180° F). After careful preparation and measurement, the raw materials are mixed and undergo initial fusion before being subjected to the full heat needed to turn the matter into glass, called vitrification. In the past, melting was done in clay pots heated in wood or coal-burning furnaces. Pots of fireclay, holding from 0.5 to 1.5 metric tons of glass, are still used when relatively small amounts of glass are needed for handworking. In modern glass plants, most glass is melted in large tank furnaces, first introduced in 1872. They can hold more than 1000 metric tons of glass and are heated by gas, oil, or electricity. The glass batch is fed continuously into an opening (doghouse) at one end of the tank, and the melted, refined, and conditioned glass is drawn out the other end. In long forehearths, or holding chambers, the molten glass is brought to the correct working temperature, and the mass is then delivered to the forming machines. The above described methods are useful for the manufacture of all but optical glass. The manufacture of optical glass is a delicate and exacting operation. The raw materials must be of the highest purity, and it takes great care to prevent imperfections to be introduced. 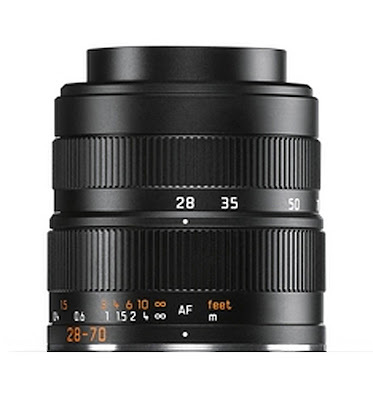 Small air bubbles and residual unvitrified matter will cause distortions in a lens. Striae, the streaks caused by incomplete chemical homogeneity in the glass, will also cause serious distortion, and strains in glass caused by improper annealing will further impair optical qualities. Annealing is a process of heat treatment by which glass is rendered less brittle and more resistant to fracture. Annealing minimizes internal defects in the atomic structure of the glass and leaves it free from internal stresses that might otherwise be present because of prior processing steps. Glass is annealed by heating it to high temperatures and then cooling it slowly. Large masses of glass are cooled within the heating furnace. Sheets are usually annealed in a continuous-process furnace. They are carried on a moving table through a long chamber in which the temperature is carefully graded from initial heat just below the softening point to that of room temperature at the end. The annealing time varies widely according to the thickness of the individual piece. Window glass, for example, requires several hours, plate glass, several days, and glass mirrors for reflecting telescopes as well as certain glasses for photographic lenses several months. Optical glass was originally melted in pots for prolonged periods, during which it was constantly stirred by a refractory rod. After lengthy annealing, the glass was broken into pieces. The best fragments were further reduced, reheated, and pressed into the desired forms. In recent years a method has been adopted for the continuous manufacture of glass in platinum-lined tanks, using platinum-lined stirrers in the cylindrical end chambers (or homogenizers). This process produces greater quantities of optical glass that are cheaper and superior to glass produced by the earlier method. The principal specifications for optical glasses are its light bending power, or refractive index, for different wavelengths or colors of light and its dispersion, the difference in refractive index for certain wavelengths. All of us have seen dispersion of light in form of a rainbow from light shining through a prism and being separated in the spectral colors. Dispersion is one of the most difficult problems to deal with in designing photographic lenses. Dispersion will introduce chromatic aberration which, when not controlled, will lead to poor sharpness and loss of detail. The best optical glasses available today display very high refractive indices with relatively low dispersion. Within the last twenty years some glass manufacturers have succeeded in producing glasses with a peculiar property called anomalous partial dispersion, first pioneered by Leitz in the early 1970s. Such glasses provide the lens designer with new and powerful means to improve the color correction of chromatic aberrations of camera lenses. Prior to the availability of glasses with anomalous partial dispersion some manufacturers used calcium fluorite crystals for the manufacture of lens elements in telephoto lenses. Especially Canon was making wide use of this. Other manufacturers, however, do not regard them a suitable for photographic lenses because they have very poor shape retention and because their refractive index is only ne1.43. Because of this relatively low refractive index, lens elements made of calcium fluorite require very strong curvatures. This has the disadvantage of increasing spherical aberration and causing substantially more surface reflections. The atlas of optical glasses shows the refractive index and dispersion of many of today’s glasses. 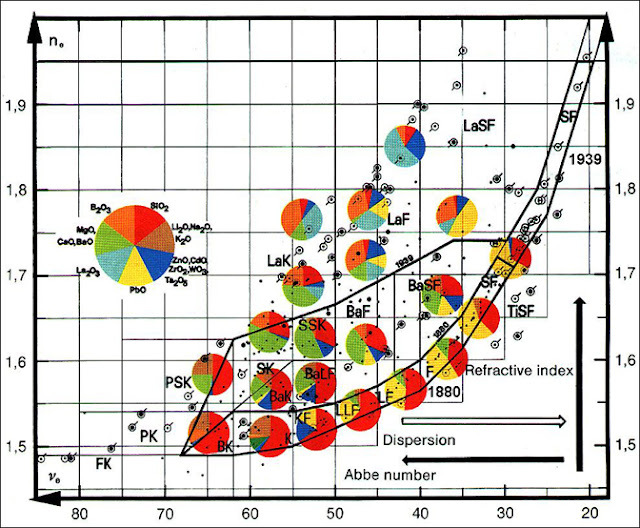 The vertical axis shows the refractive index for a wavelength of 546 nm while the horizontal axis shows the Abbe number (for Professor E. Abbe of Zeiss), or the relative reciprocal dispersion of the glass. This is a comparison between the refraction of the glass for yellow/green light in the center of the visible spectrum and the difference between its refraction for blue/violet and deep red light. Please note that these dispersion values are reciprocals: The higher the Abbe number, the less dispersion. Sometimes optical engineers need high dispersion numbers, sometimes low ones, to balance the characteristics of different optical glasses in order to produce a high degree of image correction. The advances in glass technology can easily be seen when comparing the refractive indices of glasses over the years. The Leitz Elmar 50mm f/3.5 from 1926 used SK15 glass with a refractive index of ne1.625, this increased to ne1.694 with LaK9 glass in 1953 with the Summicron 50mm f/2. In the 1969 Summicron the refractive index had grown to ne1.7479 with LaFN2 glass and the special 900403 glass developed for the 1976 Noctilux 50mm f/1 increased the refractive index to ne1.9005 which, to my knowledge, is the highest refractive index for any glass used for photographic production lenses. Leitz uses a proprietary number to avoid divulging the make-up of this glass. It was a long, arduous journey to arrive at the modern glasses at the disposal of today’s lens designers. Glasses with a relatively high refractive index were available even prior to W.W.II. However, this could only be achieved by the addition of thorium oxide to the glass. Thorium oxide unfortunately is highly radioactive, and lens designers began to search for a suitable replacement. One of the problems encountered was that by replacing the thorium oxide with a variety of other elements, the glass turned opaque. Kodak had some limited success during W.W.II. They were able to make a thorium oxide free glass with similar properties, but it was yellow in color. This glass, however, was used to make lenses for some aerial cameras. Since these were used exclusively with b&w films, the “built-in” yellow filtering actually was found to be beneficial for this specific use. At the Leitz glass research laboratory similar experiments started in 1949. After lengthy experimentation they found that lanthanum oxide offered the best chance for success as a replacement for thorium oxide. They found that glasses could be made with a refractive index of ne1.7. However, these glasses could not be made in large quantities because they tended to crystallize. This makes it difficult to prevent crystal grooves, or striae. Other substances like zirconium oxide, yttrium oxide and tantalum oxide had to be added to produce more stable high refractive glasses in large numbers. 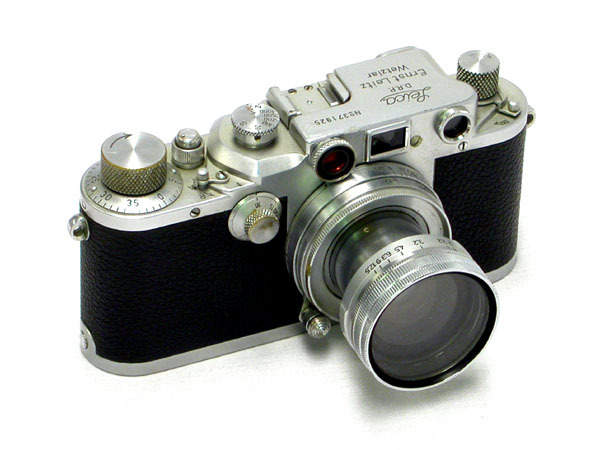 The resulting LaK9 glass resulted in the 50mm f/2 Summicron in 1953, the first production lens free of thorium oxide. Leitz granted the German Schott company a license to produce the LaK9 glass. 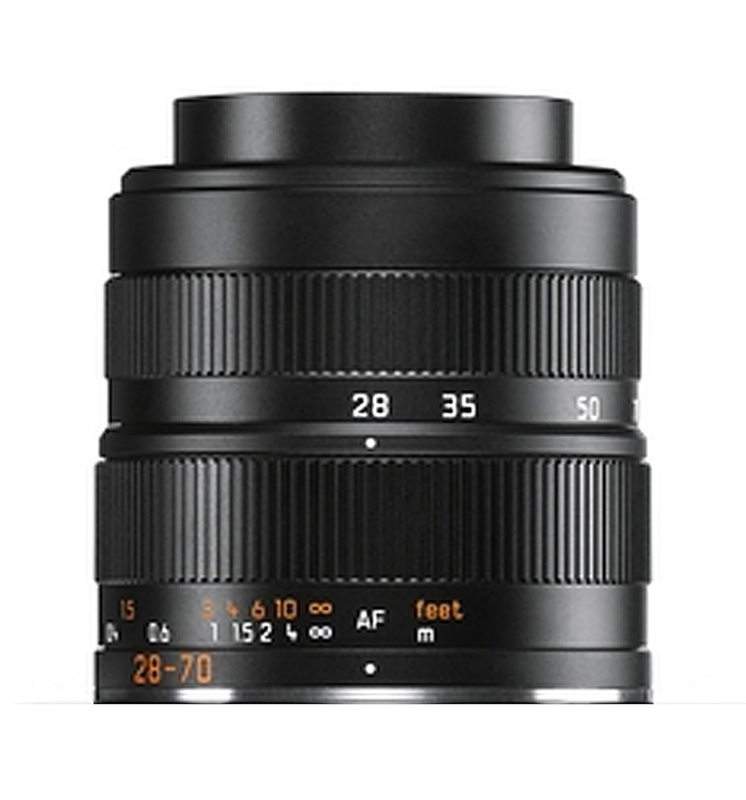 For lenses with a maximum aperture of f/1.4 glasses with a refractive index close to ne1.8 are necessary. However, these are difficult to produce. Evaporation at the surface of the molten glass, while the temperature is slowly lowered, can easily cause striae. These can only be prevented by constant stirring to produce consistent blending of the molten glass. This requires additional steps, so that one oxide will prevent another from crystallizing. These methods, for instance, have enabled Leica to use glasses with refractive indices of ne1.80 and ne1.82 and a dispersion value of ny45. For glasses with refractive indices higher than ne1.8 it is difficult to obtain enough chemicals with sufficient purity at a reasonable cost. Subsequently such glasses are very expensive. The glass developed by Leitz for the 50mm f/1 Noctilux is such a glass. It uses a much higher zirconium oxide content, which allows for a refractive index of ne1.9005 and a dispersion value of ny40. These glasses have a very high melting point of 1600° C (2912° F). At such high temperatures molecular migration of the material used for the crucibles can contaminate the glass mixture. To prevent this, crucibles of platinum or at least platinum lined crucibles are used. The stirring tools also have to be made either of platinum or must be platinum coated. In addition, the shape of the stirring tools in relation to the viscosity of the molten glass is very important for the homogenization of the glass. The temperature of the melt in the crucible has to be lowered considerably before it can be poured out. Then the poured slabs have to be cooled at a carefully controlled rate, which may last days or even months in order to prevent molecular tension. As mentioned before, most lens manufacturers don’t consider calcium fluorite suitable for lens production. Instead they prefer a true glass with an amorphous structure. It was discovered that fluorites remained stable in metaphosphate suspensions. By incorporating several fluorites, it is possible to optimize the proportions to avoid the creation of striae during the cooling process. This eventually led to the development of a true glass with anomalous partial dispersion and a refractive index of greater than ne1.544. With the addition of titanium oxide Leitz was able to produce a glass with an anomalous partial dispersion value of ny66.6 and a refractive index of ne1.544. This glass was used in the 180mm f/3.4 Apo Telyt R, originally developed for the U.S. Navy, which to this day ranks as one of the best lenses ever produced for a 35mm camera. Many of the large glass manufacturers have little interest in the manufacture of such exotic glasses because optical glass is only of minor importance to them. Construction glasses, television tubes, bottles etc. are the main income generators. When these companies develop optical glasses, they will do it only for those which will be in high demand. It is the exotic wishes of companies like Leica, Zeiss, Schneider, Rodenstock, Nikon, Canon etc. that these glasses were developed in recent years. The next time we complain about the high prices of some of the top lenses on the market, we should remember the difficulties encountered in just the manufacture of the glass. Add to that the great care which has to go into the production of the individual glass elements and the mechanical components of the lens, and the prices somehow don’t seem to be all that high after all. It is common knowledge that the Hasselblad had been chosen by NASA for their lunar missions. Many readers here have wondered if Leica has ever been involved with NASA in any form. I have written about this topic here in the past, but with renewed efforts by private companies to launch new lunar missions in the not too distant future, I feel this topic warrants new attention. An interesting, but relatively unknown fact is that NASA initially had chosen the Leica MDa as the camera to be used on their lunar missions. The MDa was basically identical to the M4 except it had no viewfinder or rangefinder. The camera was meant for work with microscopes or the Visoflex where a built-in viewfinder and rangefinder was not necessary. By the time the first lunar missions were planned, the Hasselblad had evolved as the main camera for most missions. The main reason NASA chose the Leica MDa over the Hasselblad was weight. Of all the systems for the Apollo missions, one could never be tested because of the low gravity of the moon. That was the take-off module. To gain as much of a weight advantage as possible, NASA did everything they could to save weight. That included the camera equipment. The Leica MDa with 35mm f/1.4 Summilux was definitely lighter than anything Hasselblad had to offer. Leitz modified several cameras and lenses to feature large levers to allow camera operation with the bulky gloves of the space suits. The astronauts chosen for the lunar missions all received extensive training in the use of the camera. Yet, as is common knowledge, the Leica never made it to the moon. The credit goes to one NASA engineer who figured out that the interchangeable film backs for the Hasselblad were lighter than the Leica MDa with its Summilux lens. Subsequently NASA decided to use the Hasselblad after all. The Saturn 5 rockets had no problem delivering the payload to the moon. For the return trip it was subsequently decided to remove the film backs from the cameras and to leave the cameras on the moon where they still reside today. A total of 12 Hasselblad cameras are sitting in the lunar dust, ready to be picked up. But there are more Leica - NASA connections. 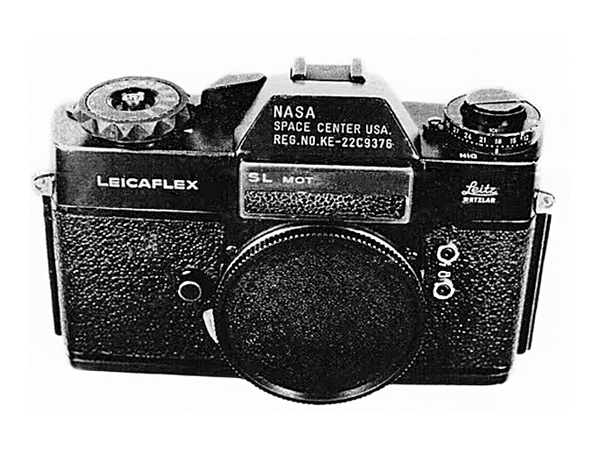 One virtually unknown fact is that NASA also used the Leicafelx SL. For what purpose is unknown at this point. 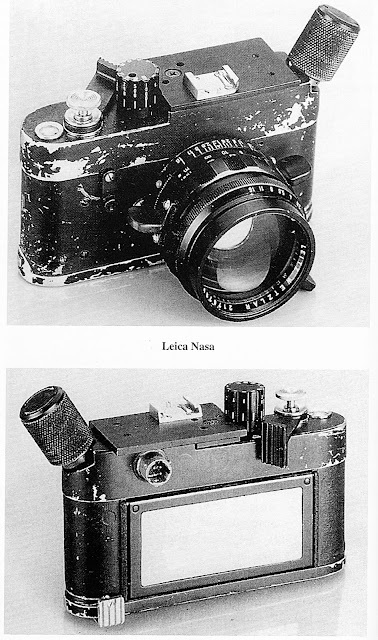 I have also found that in 1966, NASA ordered 150 Leica cameras. Unfortunately it was not stated which cameras they were. 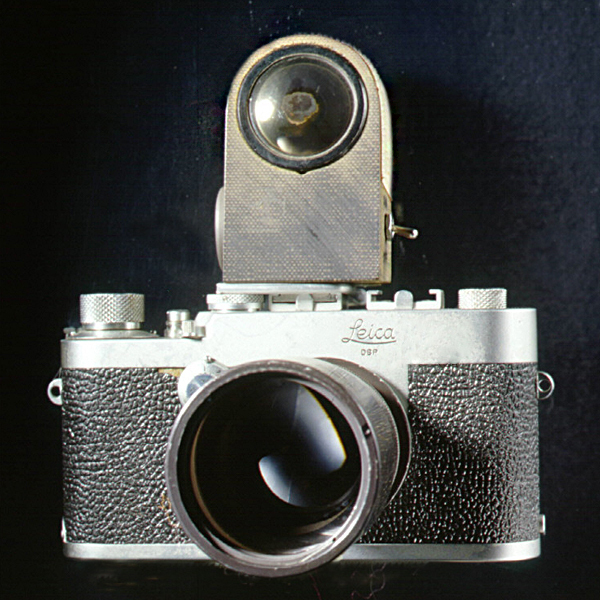 Another Leica camera was used in conjunction with a spectrograph. It was used on the Gemini V and VIII missions. Longer missions during the Gemini program gave astronauts more time for scientific experiments, often created and monitored by other government agencies or academic institutions. Scientists at the U.S. 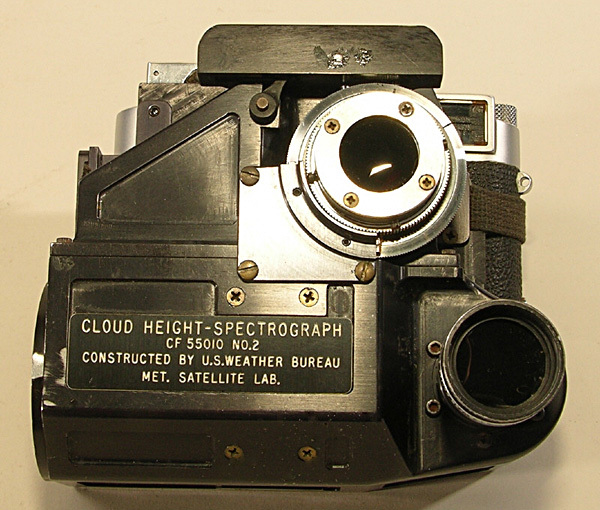 Weather Bureau (now NOAA) created this camera attachment so it could simultaneously record a spectrum and an infrared image to determine cloud heights. 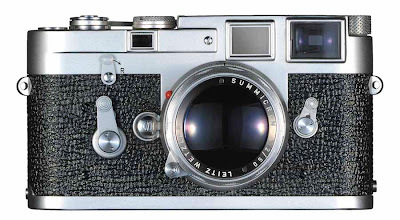 "I think the world of that camera," said Patnesky, who shuns more modern gear with the automated features that focus and advance film in favor of the all-manual Leica M3. "I have other cameras, but they don't measure up," he said. ""Anyone can just go shoot. Anyone can be a photographer, but not everyone can be a photojournalist." "I feel kind of naked without it," he joked recently, clearly relieved that the old camera was available once again for his patrols of the space center's astronaut training facilities. "None of the other dingbats would use it. So I said, `Hey, give it to me,' " recalled Patnesky, who spares no one, least of all himself, from his playful verbal digs. "I like to shoot on a noninterference basis," he said. ""That is how you get the best shots." "My friendship with the astronauts means a helluva lot to me. I admire those guys for all the hours they put in," said Patnesky. ""One way or another I've photographed every one of them." 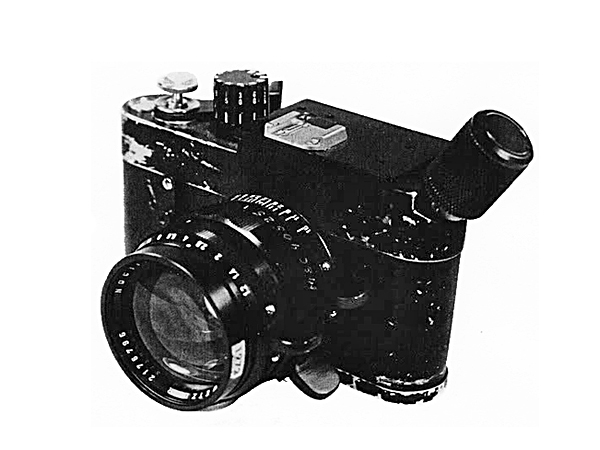 An even earlier Leica camera, a Leica Ig model, was used by astronaut John H. Glenn, Jr., to take the first human-shots, color still photographs of the Earth during his three-orbit mission on February 20, 1962. Glenn's pictures paved the way for future Earth photography experiments on American human spaceflight missions. I will keep on researching the Leica – NASA connection, and as soon as I have anything else to report, I will do so. Reader Eric Hurtado sent some additional pictures of the lunar Leica from France. These pictures show additional modifications, an enlarged grip pad on the film advance lever as well as on the lever to open and close the lock for the removable base plate. The base plate lock is especially interesting since it indicates that it was apparently planned to have the astronauts change film when necessary. Also visible is the reinforced top plate with an accessory shoe attached and an electronic connection for which there is no explanation. Every once in a while we come across lenses from manufacturers other than Leica which are of definite interest and well worth their use on Leica cameras. 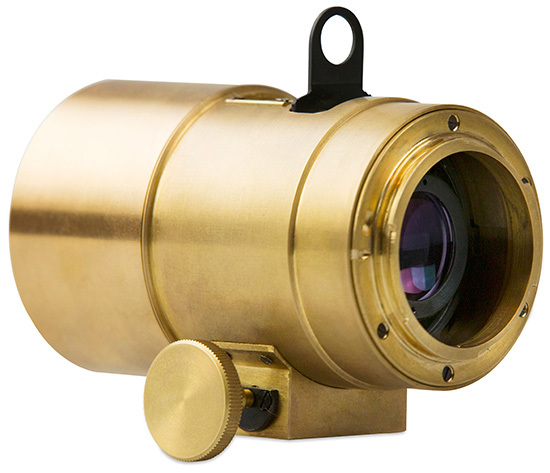 One such lens is the new Petzval lens from Lomography. 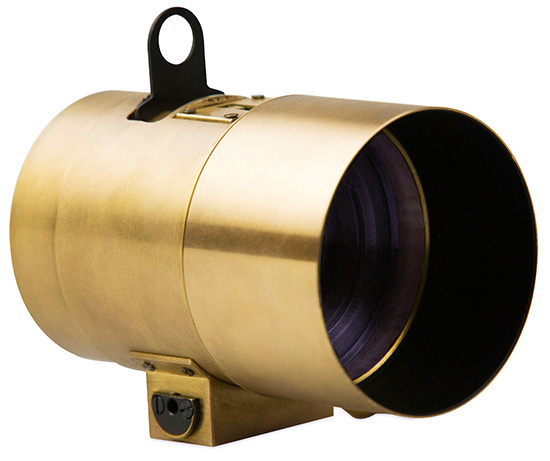 The Petzval name is one of the most famous in the history of optics and the development photographic lenses. It was first introduced in 1840 by Joseph Petzval, a Hungarian mathematician, inventor, and physicist best known for his work in optics. Photography was just in its infancy, with photographic materials and lenses being very slow. Especially portraiture was difficult because lenses were very slow in those days. 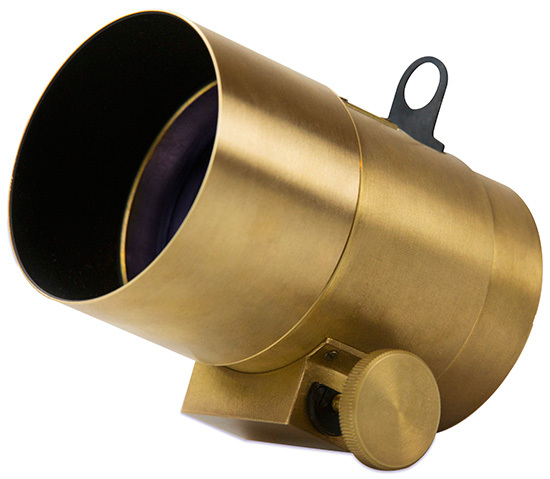 Petzval set out to overcome that problem by designing a much faster lens. When he designed his famous portrait lens in 1840, it constituted a quantum leap in optical design. The lens had the unheard of aperture of f/3.6. 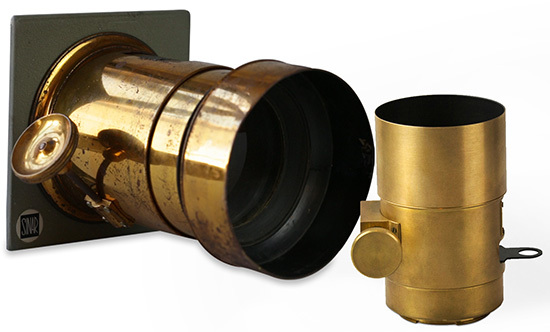 Petzval's portrait objective lens (Petzval Porträtobjektiv) was an almost distortionless anachromatischer Vierlinser (double achromatic objective lens, with four lenses in three groups). The maximum aperture was substantially higher than the Daguerre standard of 1839, the Wollaston Chevalier lens (f/16). The speed of f/3.6 with a focal length of 160 mm made crucially shorter exposure times possible — using exposures of only about 15 to 30 seconds compared to the 10 minutes previously. Thus, snapshots became possible for the first time. Petzval allowed the Viennese entrepreneur Peter Wilhelm Friedrich von Voigtländer to produce the lens for a one-time payment of 2,000 guldens, without a patent or a contract, which led later to a lasting controversy between Petzval and Voigtländer. Voigtländer, who had confirmed the process through his own calculations, produced a prototype, and in May 1840 he began production of the lens for the daguerrotype cameras in 1841, making a fortune in the process. Now Lomography is resurrecting this lens in partnership with Zenit of Kranogorsk, Russia. The New Petzval Lenses will be manufactured by a team of optics specialists at the Zenit factory. They are built from brass and feature premium glass optics. Photos shot with a Petzval lens are immediately recognizable for their super-sharp focus and wonderful swirly bokeh effect at the non-focused areas, including strong color saturation, artful vignettes and narrow depth of field. The new lens will have a focal length of 85mm with a maximum aperture of f.2.3. Apertures will be set via Waterhouse stops down to f/16. The image circle has a diameter of 44mm with a field of view of 30degrees. The closest focusing distance is 1 meter. The lens will initially be available for Canon EF and Nikon F DSLR mount cameras. Either one of these will allow use on the Leica M and Leica Digilux 3 with an adapter. No word on the availability of the lens yet, but it is definitely an item tyo look out for. During my stay in Germany last month, French magazine Focus Numérique published an interview with Dr. Andreas Kaufman, Chairman of the Board of Leica. Unfortunately, the interview cannot be republished here, so here are some of the main points. Probably the most interesting response was in regard to further developments of Leica cameras and lenses. 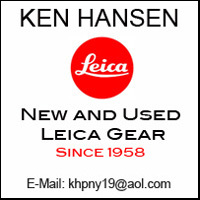 Dr. Kaufman was asked that the company has introduced a lot of new products within a short period of time, namely the Leica Monochrom, M, S, and X series of cameras, if this pace can be maintained. Dr. Kaufman answered that they do not intend to interrupt the development of new products, that they have a lot of new items in the pipeline. He went on to say that Leica will have something new this fall and in spring. He also said that it makes sense to further develop monochrome devices because is the best way to shoot in black and white and more and more photographers use black and white. He reiterated that Leica has no intention to introduce a DSLR camera. He sees no need for this because the current Leica M is perfectly capable to utilize any of the Leica R lenses. He sees no further need for SLR viewfinders because the newly developed electronic viewfinders are perfectly capable to take their place. When asked about the current one year waiting period for the Leica M, Dr. Kaufman said that this they hope to be able to reduce this to three months by the end of the year. He went on to explain that the main reason for the delays is the fact that demand far outstrips the manufacturing capacity at the current plant in Solms. It should be interesting to see if the rumor mill will begin to guess as to what new products we might expect to see this fall and next spring. One thing is for sure, Leica is riding a wave of success, and they will certainly do everything possible to assure the continuation of this. Before the official introduction of the new Leica X Vario, Leica started a very effective campaign to – slowly – introduce the camera. The campaign teased the camera as a Mini M. It started with a row of cameras, including the Leica M, a box marked as Mini M, the Leica X2 labeled as Micro M and the D Lux 6 finally as Nano M. Over the course of several weeks, the box was shown opening and revealing more and more of the new camera. The campaign created an unusual amount of interest, primarily because many succumbed to the wish for a less expensive model of the Leica M; they allowed the description of Mini M to get the best of them, and once the camera was introduced there was a general outcry of disappointment. The camera was immediately highly criticized as just being a Leica X with a zoom lens. The fact that the other cameras in the ad, the X2 and the D Lux 6 being also referred to a some sort of M camera made little difference, even though this should have been an indication that the Mini M designation was not meant as a serious indicator of what the camera would actually be like. Once the camera had been officially introduced, I published an article, outlining the specs of the camera. Not having actually seen it at that time, I reserved my judgment and said I would report on it here after I had had a chance to see it during my visit to Leica in Solms last month. 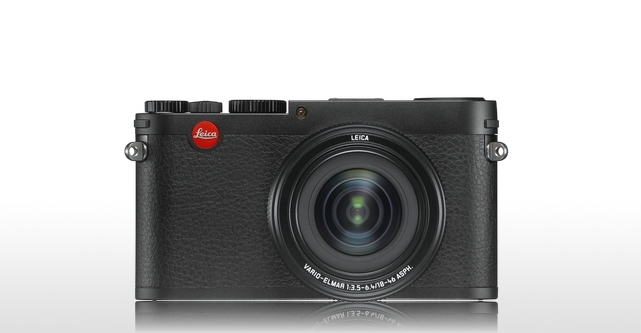 The camera immediately impressed me as looking much more like a Leica M than the smaller Leica X. In terms of size it fits directly between the Leica M and the Leica X2. Of course being a zoom, the lens is obviously larger than the 35mm (equivalent) lens on the Leica X2. Holding the camera, it became immediately clear that this is a very solidly built camera with an excellent finish. I immediately liked the larger size which ergonomically feels a lot more like an M than the X2. I must admit that I have never been overly bothered by larger and heavier cameras; I even liked the M5 and a Zeiss Contarex. A direct benefit of the larger size of the camera is the larger viewing screen in the back. It is a gorgeous display and might be the same screen as the one in the Leica S and the Leica M. Andreas Dippel, public relations manager for Leica assured me that a tremendous amount of thought went into the camera, much beyond simply adding a zoom lens to the Leica X2. The camera was purposely laid out much more like a Leica M than the X2. This included the characteristic step on the top cover with an imbedded hot shoe. The result is a very well balanced camera that simply feels good on ones hands. Besides not being a smaller, less expensive M camera, the most criticism involved the lens, particularly the relative slow aperture range of f/3.5 – 6.4 with only a 28mm to 70mm (equivalent) zoom range. Of course it is easy to criticize, especially if knowledge of optical design is lacking. A zoom lens is obviously a welcome addition to this type of camera. However, two important points were foremost in the mind of Peter Karbe, the head of optical design at Leica. One was the weight and size of the lens with the other being its overall quality and optical performance. The lens features 9 elements in 8 groups with two aspherical surfaces. While Leica is certainly capable of making faster zoom lenses, the lens on the Leica X Vario has proven to be of a perfect compromise between size and overall performance. The relatively slow aperture range actually offers two significant advantages, one being the relatively small size of the lens and its incredible image quality. In other words, Leica couldn’t offer a faster maximum aperture without making the lens much larger or sacrificing performance. There are plenty of lenses from other companies which settle for sub-par performance in favor of size and specs. This is definitely a Leica lens with all the feel and quality usually only found in Leica lenses. While not a small, pocket camera, Leica succeeded in making an impressively capable picture taking machine in a small, portable layout. That is the Leica X Vario and this is the way it should be looked upon. Er galt als Institution, immer angetrieben von einer sich selbst auferlegten Chronistenpflicht. Staatsbesuche, Auslandsreisen, Parteitage - wo andere Fotografen hinwollten, stand er meist schon. Sein Ziel waren keine steifen Handshake-Bilder, sondern situative, aussagekräftige Aufnahmen. Auch das berühmte Foto von Ex-Kanzler Willy Brandt mit dem DDR-Spion Günter Guillaume am Ohr stammt von Darchinger. Solche Aufnahmen werden auch nach seinem Tod haften bleiben. Darchinger starb am vergangenen Sonntag im Alter von 87 Jahren in seiner Heimatstadt Bonn. Darchinger war immer dicht an den Politikern, aber stets auch um Distanz bemüht. Ein Fotograf müsse immer Abstand wahren, dann sehe er mehr, war sein Motto. Viele Politiker kannte er über Jahrzehnte, und sie öffneten für ihn auch ihre Privaträume. «Das Auge von Bonn» nannte ihn das Nachrichtenmagazin «Der Spiegel», für das der Rheinländer unter anderem tätig war und über die Jahre rund 10 000 Aufnahmen beisteuerte. Unvergessene private Bilder schoss er insbesondere von den SPD-Kanzlern Willy Brandt und Helmut Schmidt. Er hielt fest, als Rut Brandt ihrem Mann für den Bundespresseball 1967 die weiße Smokingfliege am Hals zurechtrückte. Auch als der damalige sowjetische Parteichef Leonid Breschnew 1973 innig die Hand von Rut Brandt küsste, drückte Darchinger auf den Auslöser. Von Helmut Schmidt allein hat er fast 40 000 Bilder gemacht. Dazu gehören auch Aufnahmen von Schmidt in seinem Ferienhaus am Brahmsee und beim Segeln. Ein exklusives Bild gelang ihm, als der damalige DDR-Staatschef Erich Honecker im Dezember 1981 vom Bahnsteig in Güstrow (Mecklenburg-Vorpommern) Schmidt ans Zugfenster noch ein Hustenbonbon zum Abschied reichte. Der 1925 in Bonn geborene Darchinger war Autodidakt und nannte sich selbst «Fotojournalist», eine eigene Wortschöpfung für das Finanzamt. 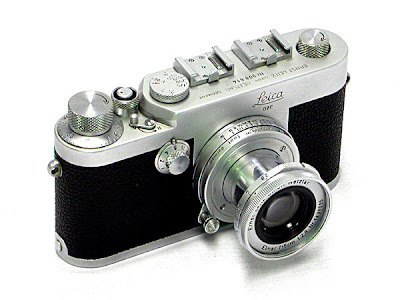 Seine erste Kamera, eine gebrauchte Leica IIIc, hatte er einem Kriegsberichterstatter der Wehrmacht abgekauft. Sein umfangreiches Werk übergab Darchinger dem Archiv der sozialen Demokratie der SPD-nahen Friedrich-Ebert-Stiftung in Bonn. Das Archiv umfasst rund 1,6 Millionen Negative, rund 60 000 Positive und 30 000 Dias. Mit dem Regierungsumzug nach Berlin 1999 zog sich Darchinger allmählich aus der aktuellen Arbeit weitgehend zurück. Seine beiden Söhne Frank und Marc sind ihm im Beruf und in eine neue digitale Welt gefolgt. After visiting Leica in Solms, the next day I went to Wetzlar to see how the new Leica headquarters at Leitz Park are progressing. Coming from Weilburg, I went through Braunfels with its impressing Burg Braunfels (Braunfels Castle) and then through Solms and on to Wetzlar. Driving past the large building of the former Leitz headquarters brought memories of past visits to Leitz in Wetzlar. These building now are occupied by Leica Microsystems, the former microscope division of Leitz. Even unfinished and without any landscaping, the construction of the new building has progressed to a stage where the looks of the finished structure can be clearly seen. It is an impressive building with a thoroughly modern architecture. The architecture firm Gruber + Kleine-Kraneburg designed the new production, administration and customer care headquarters. It is expected to open in early 2014, with an area of around 27,000 m² (approximately 290,625 ft²). The new energy-efficient building will be home to openly visible production areas, the new Leica Museum, Leica Gallery, Leica Store, photo studio and a restaurant. The production and administrative buildings are being built to the latest environmental and energy-efficiency standards and will allow Leica to rapidly satisfy the demand for Leica products without the delays experienced in the past. When visiting with Andreas Dippel, public relations manager for Leica during my visit in Solms, (see http://gmpphoto.blogspot.com/2013/07/my-visit-to-leica-camera-ag-in-solms.html) we briefly talked about the move back to Wetzlar. It was very obvious that the people at Leica are very enthusiastic about their new home in Wetzlar. His eyes clearly showed the pride and anticipation of the move. I asked if there were any plans for the facility in Solms. Initially is had been planned to sell the building, but considering the recent production shortfalls and the renewed popularity of Leica products, Leica is looking to keep the Solms building in case further production capacity might become necessary. I am now looking forward to my next visit at Leica which will allow me to see and experience Leitz Park and the new Leica headquarters in their finished appearance.